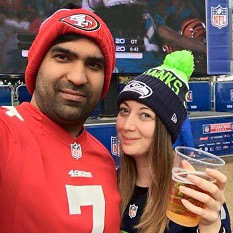 On Thursday evening last week, I posted a survey which would help me understand where in the UK has the biggest NFL fan base and also who the most popular NFL team. Over the course of four days, the survey received a staggering 1,000 responses, something I absolutely did not expect so a huge thank you to everyone who got involved! I’ve always known the game the be heavily male-dominated and this became very clear in the results when asked about gender. Out of the 1000 responses I received only 9% were female with 90% male. 1% preferred as other or preferred not to say. When asked about age, results showed that 41% were between 25 and 34 and 27% being between 35 and 44, both results you could well link to the game being popular in the 80s and 90s (and this too makes sense when you see the most popular teams below). Only 2% were under 18, 14% of fans between 18 and 24 and 16% of fans were 45 and older. Now I’d certainly be interested to know if people are surprised by this or if it is in line with expectation. This next statistic is one that surprised me and made me proud all at the same time. Greater Manchester and Greater London were at a complete tie for counties with the largest fan base. The most popular cities for fans are London with 12%, Manchester with 8%, Glasgow with 4% and Liverpool with 3%. NFL UK take note of this, this result alone should surely be a reason why you consider taking the game elsewhere than London. Looking at the fans who have been to a game here in the UK, 74% had, with 25% having not. The main reason for this being affordability. Without a doubt, something the NFL need to look at. The cheapest tickets including booking fee are still around £50, put on top of this food at the game, travel costs, accommodation. For a family travelling from outside of London this can become extremely pricey. 27% of fans were lucky enough to have been to an NFL game in America. Something I myself am hoping to do during my visit to New York in September. The final question I asked in my survey was “Would you like to see an NFL franchise here in the UK?”. Now this one really surprised me. 41% of fans here in the UK would like to see a franchise here in the UK. 30% against it, and 29% were still undecided. Everything I see on my Twitter timeline says fans are against it, yet this survey tells me otherwise and in fact, the majority would in fact like to see a franchise here. Overall, I think these results are very very interesting and I’m intrigued to see what happens with NFL here in the UK over the coming years. Personally, I’d like to see them reduce price slightly to allow for more fans from all over the UK to afford to come to a game. I’d also love to see them test out visiting elsewhere in the UK. Would love to hear your comments and thoughts on these so please feel free post them below or tweet me at @NFLGirlUK. Hi Peter. Thanks for taking the time to comment. I appreciate that 1,000 replies isn’t representative of the fans who attend the games year in year out, but as a blogger who simply loves to write about the game, that’s a pretty decent response. You’re right though, it isn’t representative but it never was going to be, I don’t have the same contacts that the NFL does, I simply have a Twitter account, a Facebook account and a couple of forums to frequent to help me promote it. Had I have been the NFL for example, I could have emailed my survey to the entire database, tweeted it to their thousands of followers etc but I’m not the NFL, I’m just a fan trying to get some insight in to NFL fans in the UK. 1000? the UK Dallas Cowboys facebook page has well over 1000 member and they are not even in the top 10? when the Cowboys played at Wembley last year they have 50% of the stadium so there is 50k fans there. Hi Dave, I’m sure there are more than a thousand but I should point out, I don’t have the funds to run a survey over 1,000 responses. SurveyMonkey isn’t free (actually, it is to the first 100 responses), it’s £26 for a months worth of access which then allows you to get up to 1,000 responses, then an additional 15p for extra responses. I don’t earn money from my blog, this is simply something I just enjoy to do. If any businesses out there are willing to sponsor such a survey then I’m willing to take it to the thousands of fans there are. Not really. You Cowboys fans ALWAYS think you have more fans than you do PLUS you always expect more coverage than you do. A fact you might be interested in is that the Cowboys are A: most hated team ever in NFL. B: most over-rated team in NFL. C: Most annoying fans in NFL. D: Most over covered & over-hyped team year in and year out. Jerry’s World is as big a joke as MJ’s Neverland Ranch. The 90’s the Cowboys deserved the coverage. Stop living in the Past. You fans only come out when they win. And just like a certain Premiership every year is your year to win the Superbowl (as it is their’s to win the Premiership). Pittsburgh and New England deserve it much more than the Cowboys. This year the Rams will probably rank and rightfully so. Cowboys fanbase is shrinking and you want to hope San Antonio never get a team. I would like to thank you Liz for taking time out of your busy schedule to get this survey up. I think what people should appreciate is, this is a flash survey almost that takes a quick snapshot of an ever changing demographic of fans. I was actually surprised how many Texans fans you got out of the 1000. There was results I expected there to be like the big teams at the top and some that I found surprising like the percentage backing a franchise. I hope you keep going with your unique ways of conveying info on the NFL in the UK. I look forward to what you have next. I’d also Like to thank Liz for this survey and it is very, very interesting. I’d like to remind the naysayers above that even in national events like a General Election, most weekly polls are based on sample sizes of just over 1000 people – and that’s forecasting something as economically important as which party might run the country for the next 5years. Well done Liz – keep up the good work. All of your work on here has given me a great deal of insight into the NFL in the UK and I have used your articles and this survey in my Dissertation on the growing popularity of the NFL in Britain. As someone who has been doing research into this field of study and sent out a survey to gather data on the subject, I know full well how hard it is to get that many people to respond. I managed nearly 500 participants and it was really hard to obtain that so well done at getting 1000. You are never going to get a massive amount of people filling in the survey so some of the people who have left comments on here about the amount of participants have clearly never tried to get a questionnaire filled in before. Thank you so much for your work and continue doing what you clearly love doing. Pretty much checks out . . . clearly, there aren’t many masochistic idiots in the survey sample, and that’s why we don’t see the Lions, Browns, or my Vikings in reflected well within the poll! Thanks for doing it!